Nicole really dug me. She dug me because I understood her. But to understand her was easy. Anyone could have done it. What I think she meant was that I took the time to listen to her. She came to LA at a very important time in her life, a defining moment, something I didn’t truly understand, didn’t know the complete story. She had left the place of her birth, a “cursed” town near San Bernardino, from where she had desperately wanted to get away for years, ever since she was a little girl, and leave her “crazy family” behind. And then she confided that she had come to Los Angeles because she had to get away and, also, because she wanted to be an actress, “you know, in the movies.” She said this with more shyness than usual. And, since I wanted to be a writer – not a Hollywood writer, just a writer – we made a sort of pact: she would continue working as a checker in the Malph’s Supermarket down the block and I’d stay in the apartment writing a best seller and then she’d be in the movie based on the novel. But it was terrible. Not the novel. I never wrote the novel. My heart ached throughout the six or seven months I stayed with her. And after a while the guilt became unbearable. I had bought a second hand typewriter from a pawn shop on Santa Monica Boulevard, near Western, not far from the apartment, and every day I’d sit in front of it but hardly ever typed anything. What I did mostly was read. I was a college dropout and I realized the hard way that you couldn’t be a real writer without knowing what the good writers before you had thought and said about life, humanity, and the world. If you don’t quote these writers no one will believe you are serious about writing. One has to watch out, though. For a while I was quoting famous writers all the time. Then I became conscious that I was becoming a show-off. “So, where are you now?” Nicole would ask when she got home from her job and saw me sitting in the living room in front of the typewriter. I had to say I was kidding, and had to reassure her that I would not write that. My heart was breaking into little pieces. I knew I had to go. She had grown up watching glamorous women in the movies and on television and always wanted to be one. I never really believed she wanted to be an actress. I knew she liked the idea of being one; the idea of being famous, being privileged; a celebrity, a movie star. TV was really important to her. The I Love Lucy reruns were her favorite. Lucy was a sort of crazy saint. Someone whom she worshipped. “All my life I’ve watched her,” she said, looking at me over her shoulder. You could see in her eyes a sort of religious devotion to Lucille Ball, or Lucy, the TV character. But, unlike Lucy, Nicole was never screwy or funny and never tried to be. She was shy and sentimental. She was always looking out the living room window. I sat near it in an old chair, behind the typewriter which sat on a tray with four legs. It was the first thing she did when she entered the apartment when she got home from work. She did the same thing in the bedroom. It was a sad ritual and I had to witness it daily. The apartment was on the second floor, facing the back, and there was nothing out there but a few trees and a tall fence that separated our building from the other. But she stood there for a while looking out, staring, waiting, and, I guess, hoping. Also, whenever I’d start a conversation that was not about celebrities (all the conversations she’d initiate had celebrities as the main topic) she’d go to the window and stick her head out while I spoke. I knew she was waiting for something that was never going to arrive. No one ever wrote to her. Her friends took advantage of her, especially Annie, her ex-roommate, who walked out on her and had left without paying her share of the rent. And she had had two abortions, two successive boyfriends who had walked out on her. She was twenty years old. In the evening, after I did my reading for the day, we’d smoke weed and talk about trivial things until we went to bed and made love. And on those evenings when there were no drugs and no friends around, the sadness I felt for her and for myself was sometimes extreme. Those were nights of tears, in her eyes and mine. I Love Lucy was on at around dinner time and I had to watch it with her while we ate our burritos, or tacos, or chili burgers. At times she would compare me to Ricky. “Sometimes you talk just like him,” she’d say. “See? That’s how you say it. Just like that. You’re the Mexican Ricky Ricardo.” She knew Ricky Ricardo was Cuban, of course. And she was supposed to know I was not Mexican. But, television can turn a Dominican into anything it wants. Apparently her family didn’t like Mexicans. One time, for I don’t know what reason, we were supposed to go to that town she was from, over there by San Bernardino. I didn’t really want to go but when she told me her mother and siblings lived in a trailer I thought that it would be interesting. And it was something I wanted to see, in case I decided to write that best seller. But we never did go, I forget why. Nicole had gone to the LA West: School for Actors. She took night courses. But never graduated. She dropped out because after two quarters she could not afford a third quarter. It was easy to see that she, and that small group of fellow would-be actors that sat on kiddy chairs listening to their instructor, were being suckered. “Get used to yourselves being someone else,” he used to tell them. I met her just before she dropped out. I had just gotten a job at the school as a janitor; the janitor’s assistant, to be precise. In the daytime the place was actually an experimental school for privileged kids from Beverly Hills. I started work at three in the afternoon when the kids were let out. On Tuesdays and Thursdays this guy named Fred Cohen, the instructor, rented a classroom and “taught” ingénues (ingénuas) like Nicole how to be actresses (there were some ingénuos, too). He was a con-man. I told her that “LA West” implied there was a “New York East: School for Actors.” She didn’t get it. A group of white American Buddhists also rented a classroom in the evenings. The people behind the experimental school were making money from the elite and from those at the margins, too. I didn’t expect to be “discovered” but I was in the same boat. I didn’t know how to write and had no idea how books were published. But unlike her who at least, with her failed courses, tried to get close to something along the path of an “idealized” career, the last thing I wanted was to go back to school, a career, or to get a job. Yet, the pile of books I kept on the floor, under the tray with the four legs, and the fact that I read them, were a source of wonder to Nicole. I think she admired and respected me. Unlike my family, she never questioned what I was doing with my leisure. Nicole really believed I was writing a novel. It broke my heart, but I couldn’t tell her I wasn’t. In LA I hardly ever walked anywhere. 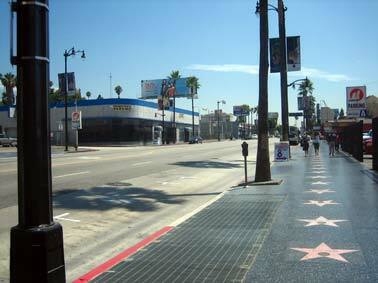 The only time Nicole and I ever took a walk together was when we went down Hollywood Boulevard one afternoon. I mean we literally walked down the sidewalk after I had parked the car on Las Palmas Avenue. We walked down the north and south side of the Hollywood Walk of Fame while a continuous stream of cars swooshed down the Boulevard. I think we were the only people walking. I never dared tell Nicole how I really felt about Hollywood, how phony the whole thing was. It would have broken her heart. But here and there I’d throw a hint or two. She kept looking down at the stars that were embedded on the sidewalk. “Haven’t you been here before?” I asked her. She didn’t know Rin Tin Tin but she knew Lassie. She didn’t know who Sabu was. “Who’s that?” she said. I told her he was an old Dominican actor from the ’40s, and she accepted it. I could have told her anything and she’d believe it. “Who was he?” she said. We were coming near the entrance to the Hollywood Wax Museum when we decided to look for some place to eat. I was tired of walking under the hot afternoon sun. Nicole looked at every star before we stepped over them. And I looked at our shadows and felt lonely while that endless stream of automobiles just kept on swooshing by us on the street. I was hungry and sweating and needed something to drink but, because I was addicted to tobacco, I lit a cigarette. In front of the Wax Museum there was a mime. He was dressed in a tuxedo and top hat and he walked towards us in his mime robotic way and he mimed to me that he desired to smoke a cigarette and “asked” me for one and I gave him one from my pack. I pulled out the book of matches I had in my pocket and, as I stretched my arm to pass it to him, he tore the cigarette in half and smiled a mischievous mime smile, as the two halves of the cigarette dropped to the concrete. It was probably a “trick” he performed with anyone passing by with a lighted cigarette (not that many people “passed by”; most people just entered the place). Nicole thought it was hilarious. I thought it was disrespectful on his part and wanted to tell him so but who’s going to argue with a mime. We began to walk again and when the light changed I pulled Nicole across the street and then we stopped at a taco stand and we ate burritos. She and I loved burritos. That incident with the mime stayed with me because of his insolence. What he did was disrespectful. He thought he had a right to do anything because he was a mime. Mimes are not real people, in a way they are just marionettes without strings. But it bothered me, maybe because cigarettes meant so much to me then. When I decided to leave Nicole and LA, I said to her that I was going to New York but that I’d be back in a month or two. And something, I can’t remember what exactly, something about my New York address, gave her the idea that I wasn’t coming back. And so the morning of my trip she took all my belongings out of the suitcase, my clothes mainly but also some books and records, and threw them out into the hallway while I showered. I had left her in the bedroom crying. After I had picked up all my stuff off the hallway floor and managed to convince her that for sure I was coming back because I loved her and because I was coming back to finish the best seller, she helped me pack my bag again, gave me back the wallet I had left on top of the dresser (minus my address book) and agreed to give me a ride to the airport. Originally published in Brick Rhetoric Magazine.